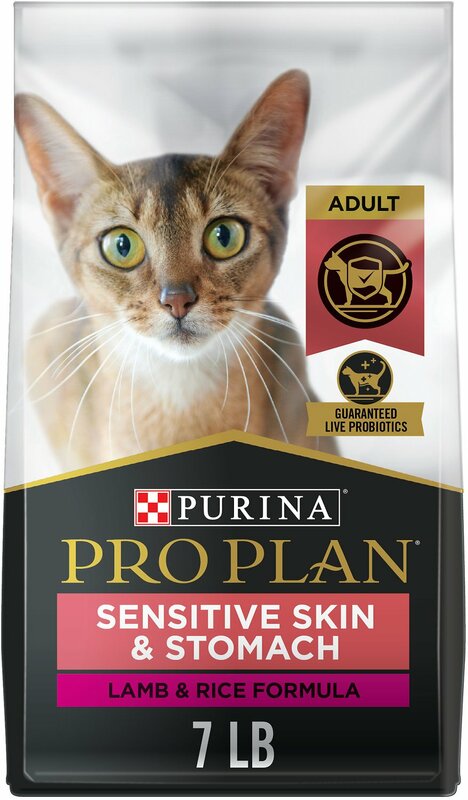 Purina Pro Plan Focus Adult Sensitive Skin & Stomach Lamb & Rice Formula is specially designed to help your cat thrive. This formula includes easily digestible rice and oat meal. It also features omega fatty acids and zinc, helping nourish skin and and promote a healthy coat. 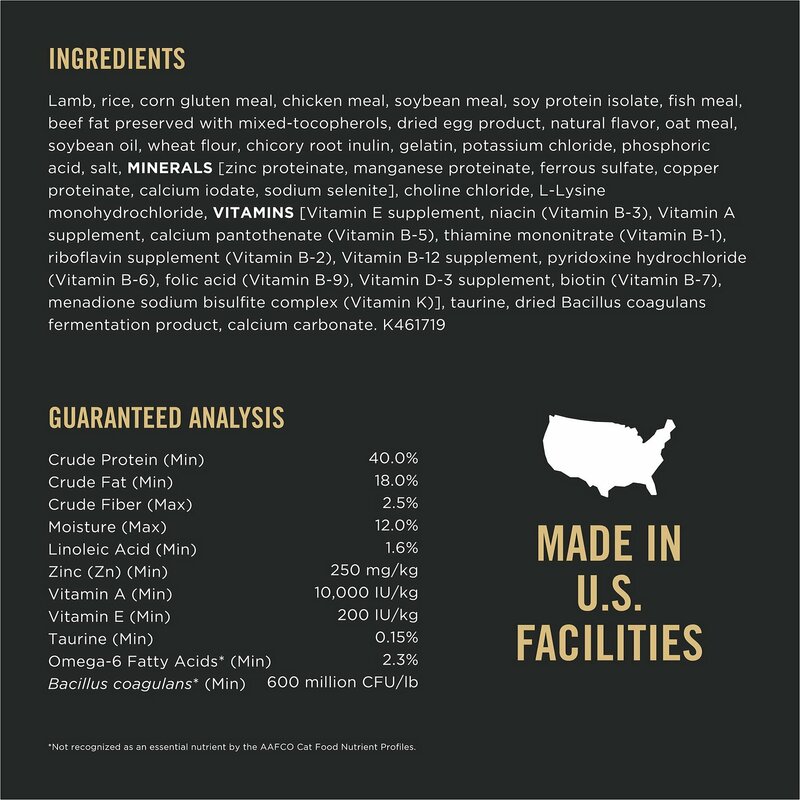 Real lamb is the #1 ingredient, and the formula is made with 40% protein. Every cat is special and you want the best for her. With over 50 formulas, Purina Pro Plan can help you find the best cat food to meet your cat's unique needs. Give your cat exactly what she needs to excel. 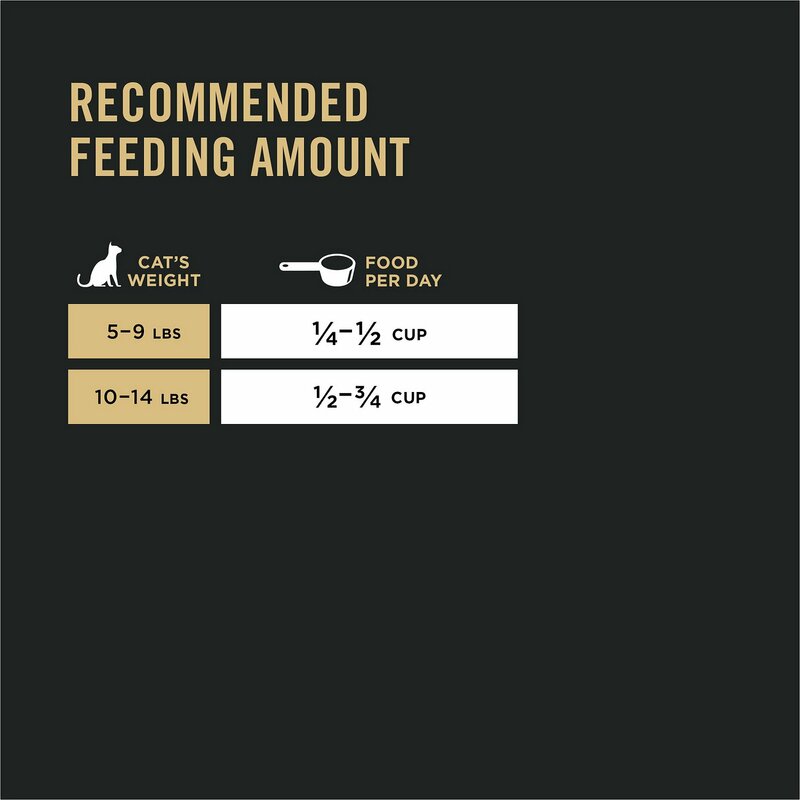 Purina Pro Plan Focus has specialized formulas to meet your cat's unique nutritional needs. So whatever her size, age, or lifestyle, nurture the greatness in your cat. 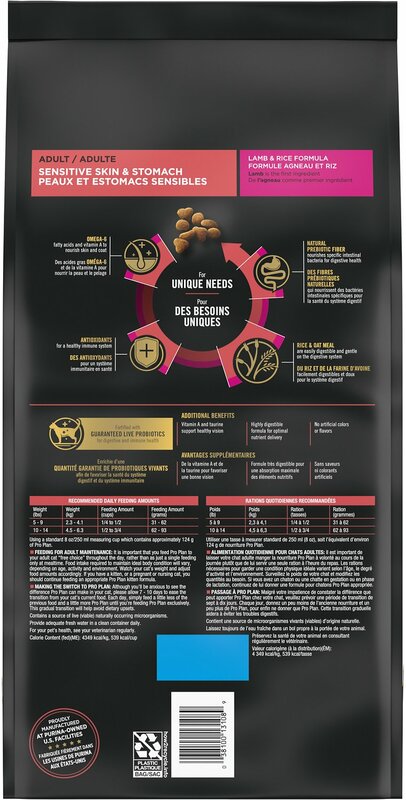 High-quality protein, including lamb as the #1 ingredient. Rice and oat meal are easily digestible and gentle on the digestive system. Natural prebiotic fiber, sourced from chicory root, helps promote digestive health. Omega-6 fatty acids and zinc help nourish skin and promote a healthy coat. Made without artificial colors or flavors. Antioxidants for immune system health. Specially designed to help your adult cat thrive featuring real lamb as the #1 ingredient creating a 100% complete and balanced diet. Made with 40% protein and powerful antioxidants so your beloved cat gets the energy and stamina she needs. 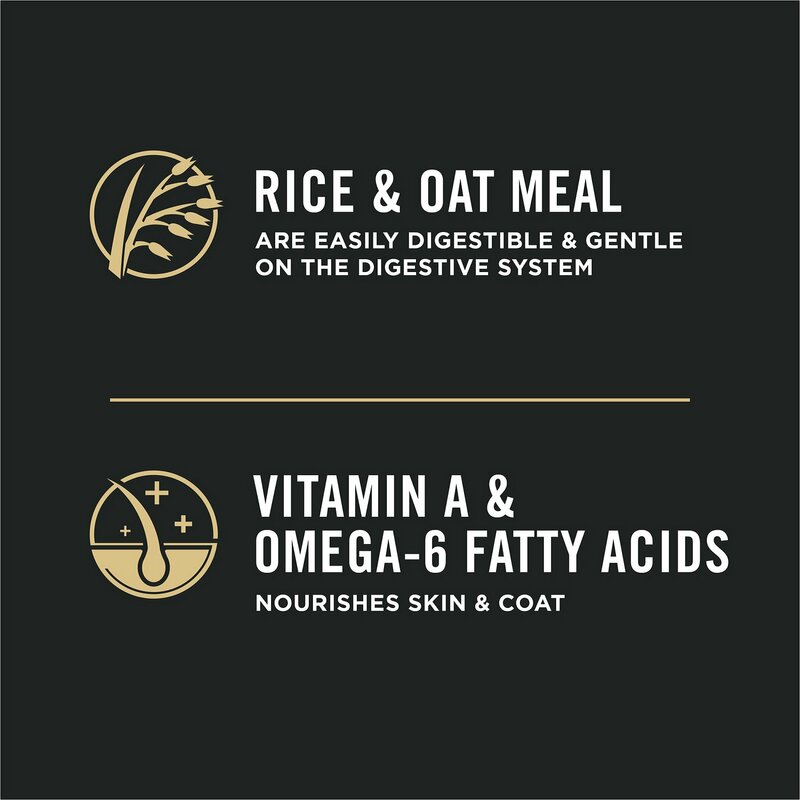 Formula includes easily digestible rice and oatmeal so it's perfectly safe for your furbaby's irritable tummy. Omega-6 fatty acids and zinc help nourish irritated skin and promote a beautiful, shiny, and healthy coat. Natural prebiotic fiber sourced from chicory root helps promote optimal digestive health. Making the Switch to Pro Plan: Although you'll be anxious to see the difference Pro Plan can make in your cat, please allow 7-10 days to ease the transition from your cat's current food. Each day, simply feed a little less of the previous food and a little more Pro Plan until you're feeding Pro Plan exclusively. This gradual transition will help avoid dietary upsets. My boy cat, Jax, loves it! Jax has a sensitive stomach and it seems like when he eats the dry food that his sisters eat, he pukes once in a while. He loves this. This has small bites, which helps my 13 year old cat chew a little easier. The bowl with this food is always empty before the bowl with the other dry food I put down for them. And Jax hasn't been throwing up, so that makes me happy. Two of his sisters like the other food a lot, that is the only reason why I haven't switched all the way. So I guess for now, I'll have to have two types of dry food, so everyone stays happy. We had tried a number of diets designed for sensitive stomachs. Purina ProPlan has been the most reliable. Our 12 year old feline has IBS. He has difficulty keeping food down. This product has worked well. My cats did not like this one at all. They did like the fish one better. Chewy seems to not have that one in stock. My older cat needs the sensitive skin and stomach one. I do like other Pro plan foods I have purchased except this one. I have five very finicky eaters who also have vomiting issues when they're on certain food. Since I've added this to their diet not only do they love it, they also keep their wet food and down as well. This dry food is the best. All my fur babies love this food. No more vomiting which is great. I recommend this to everyone. I also have my kitties on their wet food (duck flavor). She's not really a picky eater but was always vomiting and had bad digestive issues so I switched to this. She so far has turned her nose to it which worries me a little! Well give her a couple more days. I bought this flavor because I discovered that my cats love lamb. My stepdaughter brought us a lamb and rice casserole and I couldn't keep the cats off the table when I served it. I can't attest whether it helps for sensitive skin and stomach, but my cats are eating it and all doing fine. both my cats luv this food and one cat stop tossing is cat food after eating and the other luvs the food and she is very picky girl.